Above paper presented at SHEA by the VA in Ohio. The right plate is 5 secs of Sterilray on high power ~100mj/cm2. The control has ~5-6 logs of spores and the right plate ~2 logs after treatment. The spores are non-epidemic, 99.9% clean, bright phase (dormant, not germinated) spores in water. A 4″x4″ square area of the labtop was inoculated and the spore suspension was allowed to dry. 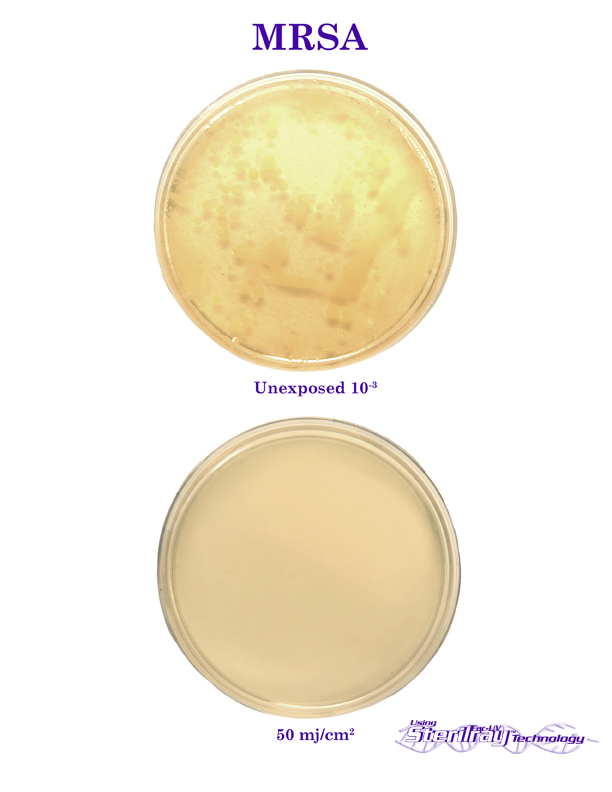 The area was touched with sterile gloves and then touched directly to pre-reduced C.diff agar plates and placed in the anaerobic chamber to incubate for 48 hours. Results from an independent study conducted by ATS Labs in MN. Part of a paper presented at SHEA by the VA in Ohio. Above are some photos of examples of cleaning patient rooms with Far-UV Sterilray. 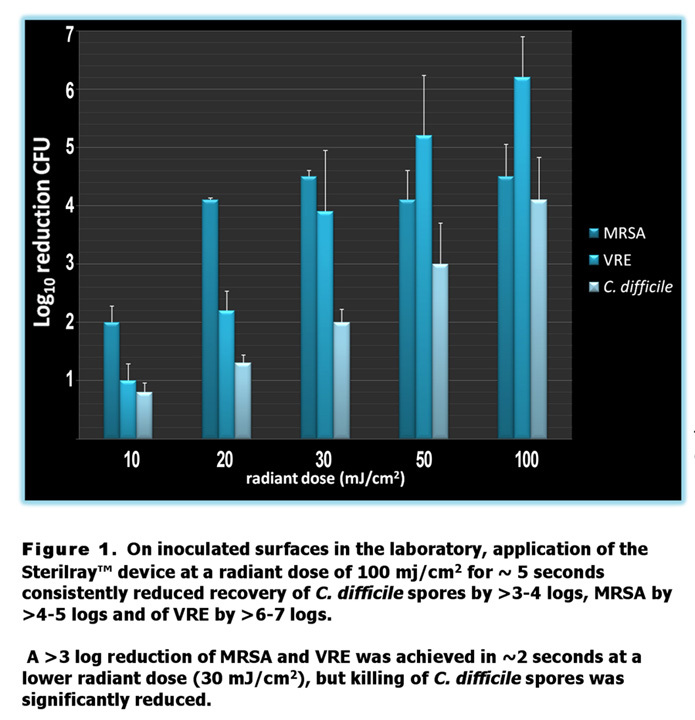 Far-UV Sterilray reduced C.diff by 96% and 100% of VRE in patient rooms. Small areas were cultured, half was swabbed as a before culture and a half was swabbed after approximately 100 mj/cm2 of Far-UV Sterilray treatment. For example, the call button (6″x3″) was split in half and the right side was swabbed before treatment and the left side was swabbed after treatment. The drawback is that we assume a homogenous area of contamination. The probability of always having one side positive and one negative is nearly impossible, so the more rooms we do, the more significant the data becomes. Testing was done on 28 rooms for C.diff and 20 rooms for VRE. 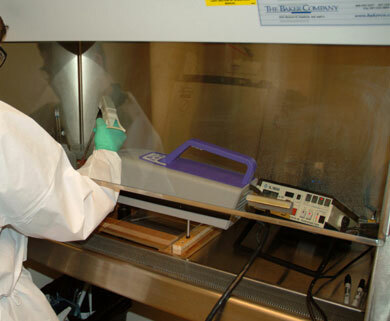 Far-UV Sterilray™ commissioned a virology lab in January 2007 to conduct a screening test for Sterilray’s efficacy against the norovirus using Feline calicivirus (FeCV) as the surrogate. 52 mj/cm2 irradiance was used on the 104 and 106 virus amounts. 101 mj/cm2 was used on the 108 amount. The results of this test show that Sterilray is as effective killing this virus as it is with various bacteria. The 1.2 log limit of detection is based on the standard 1 log dilution intervals used in this test. Future tests will not dilute the treated virus culture that will be used as the inoculant. Lower dilution factors will be used in order to reduce the log difference between rows. Changing the irradiance levels will also help to improve the accuracy of the titre. Reference: Bacteria survival is done by counting the number of live cultures after an incubation period. Virus cells cannot be counted to determine survival so a desirable endpoint that represents biological quantization is one where 50% of the virus inoculated cells show a cytopathic effect (CPE). CRFK feline kidney cells show a dramatic change in appearance when infected with FeCV. TCID50 represents this effect in inoculated cultures where TCID stands for “tissue culture infectious dose”. A series of dilutions of the treated virus are prepared and inoculated onto normal growing animal cells in replicate wells on a multi-well plate with 8 rows of 6 columns. 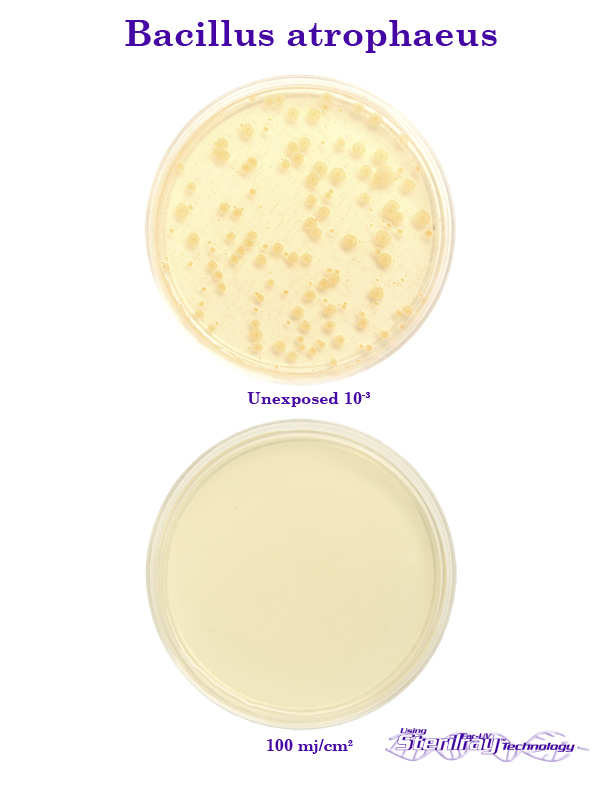 After the appropriate incubation time, the cultures are scored for positive or negative CPE. This scoring is used to calculate a titre based on a formula for limiting dilution by Karber. Critical to the use of this formula is the highest dilution giving 100% CPE which did not occur with this test, the dilution interval and the well positive proportions per dilution. Above are some photos of examples of cleaning patient rooms with Far-UV Sterilray™. Far-UV Sterilray™ reduced C.diff by 96% and 100% of VRE in patient rooms. 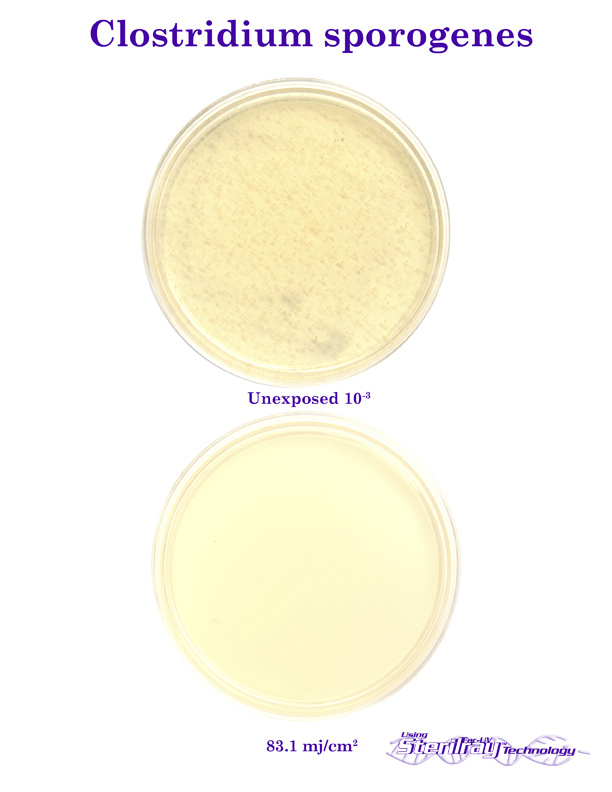 Small areas were cultured, half was swabbed as a before culture and a half was swabbed after approximately 100 mj/cm2 of Far-UV Sterilray™ treatment. Briefly, epitheial cells were exposed to UV from Far-UV Sterilray™ at lowest power setting for 5 and 10-minute durations. n= 2 for each treatment group but it does not include variance because the differences in the means between treatments were so large. Interpretation of the data: Clearly cells not protected by epidermis are drastically affected by Far-UV Sterilrayat 5 and 10 minutes. 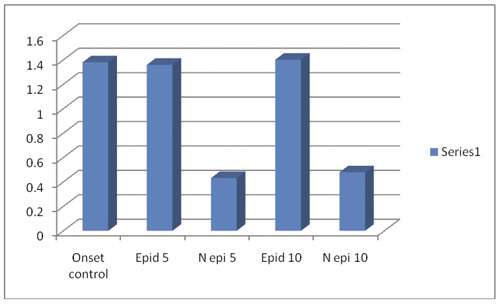 The endpoint MTT assay indicates that the apparent cell number has dropped 70% from controls. Placing human epidermis into the lightpath appears to confer protection to the cells because, within the constraints of the experimental design, the Far-UV dose was insufficient to compromise cell viability. The caveat here is that MTT is an endpoint assay so will not reveal sub-lethal cell stress per se, especially relevant is genotoxic effects, comet, and kinetic XTT or WST1 are required for that as a minimum but is certainly feasible. On the basis of the results from this look-see experiment, it appears that Far-UV Sterilray™ does not penetrate human epidermis at sufficient doses to compromise cell viability as measured by MTT assay. This experimental approach and the related data on its own is nowhere near rigorous enough to support a claim that Far-UV Sterilray™ exposure of human skin is ‘safe’. More work is being conducted to ascertain that. Additional studies are underway towards FDA approval for skin disinfection. 5 logs of non-toxigenic (ATCC 43593) C. difficile spores inoculated onto lab benchtop and spread to a finger-tip size diameter and air dried fingers touched to each inoculum three fingers touched to a C. difficile selective agar plate three fingers treated with 10 sec (100 mJ) Sterilray and then touched to C. difficile selective agar plate three fingers treated with 20 sec (200 mJ) Sterilray and then touched to C. difficile selective agar plate. The 3 micrographs represent dead Bacillus atrophaeus. They show fractures and segments that were blown off of the organism while in it’s vegetative state. The spores are contained inside this rod-like structure. 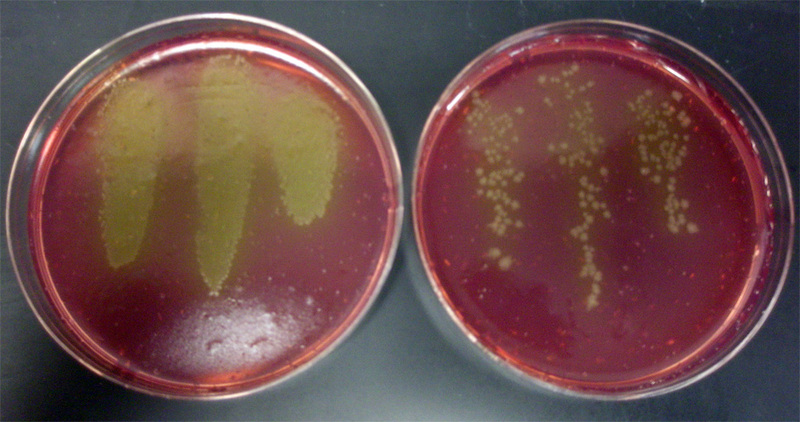 All of the organisms, including the spores, were shown to be dead by a comparable slide that was irradiated with the same exposure and then incubated. 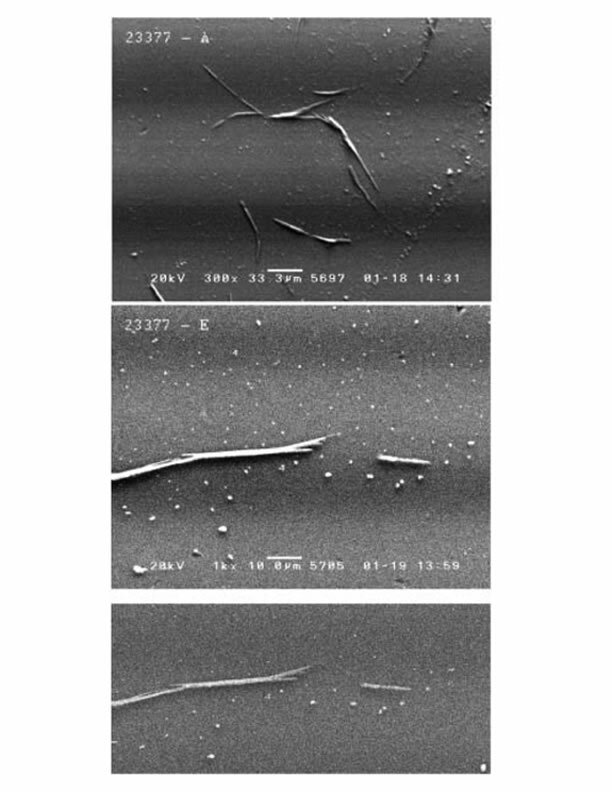 This is the first indication that Far-UV Sterilray™ is breaking bonds and killing microorganisms, not just forming dimers as with the 254 nm light. This activity confirms our theory that targeting the peptide bonds of the protein molecules in microorganisms is the best and most efficient method to ensure destruction of the offending organism. The photos demonstrate the side wall ruptures and the separation of its parts caused by an explosive force. This force most likely occurs when either the peptide bond or the disulphide bond is broken by the incoming photon(s). The outer spore coat (OSC) is rich in the higher bond energy disulphide (–S-S–) bonds which may account for the segmentation fragments. UNH Environmental Research Group performs irradiation tests using the MS-2 bacteriophage virus. 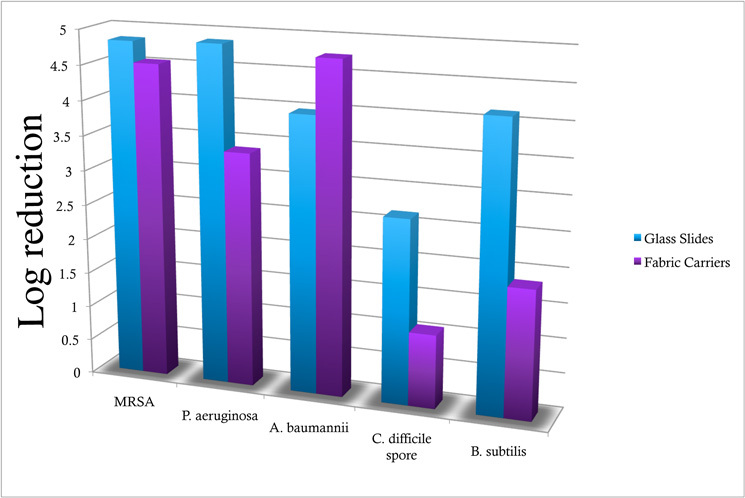 Efficacy of a Far-UV Pathogen Reduction Box for Disinfection of Hospital Equipment.